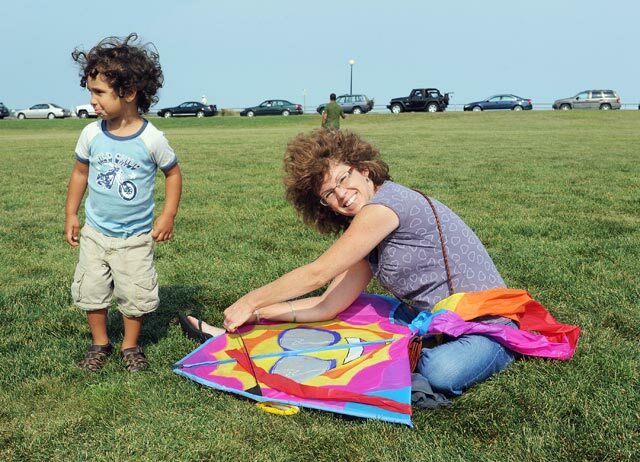 From a tiny tot with a tiny kite to a family hoisting both a 90-footer and a 105-foot string of multi-colored kites, the first annual Martha’s Vineyard Wind Festival was a carefree day for all ages and all levels of kite making and flying. More than 100 kites were flown in Ocean Park during the day-long event last Saturday, according to co-organizer Holly Alaimo. 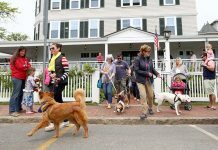 The festival ran concurrently at both Waban/Alley and Ocean Parks from noon until around six. 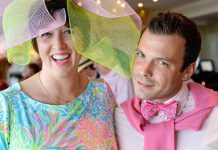 The festivities started off at Waban Park across from the Inkwell Beach where a handful of artisans displayed their wares. Jake Gifford of the Lazy Frog game store on Circuit Avenue held a frisbee golf demo and the Vineyard Gazette hosted a booth where people could construct kites from a page of the newspaper. At 1 pm, a small parade led participants over to Ocean Park for the main event, a kite flying contest with five categories and three age groups. Many non-contestants also flew kites and a number of people just showed up for the spectacle. Some entrants travelled from off-Island to take part, including Oliver Halperin of Dedham, whose 90-foot snake-like kite won for largest kite in the 12- to 15-year-old age group. His father, Mark Halperin of Vineyard Haven, flew the largest kite in the over-16 age group, a 105-foot-long streamer built by his 97-year-old father. After steadfastly holding her pirate kite high in the sky for more than two hours, three-year-old Sophia Edwards of Quincy walked away beaming, with the 11-and-under award for smallest kite.